Royal Tine Outfitters offers Montana elk hunting at its best. 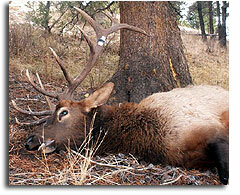 Guided elk hunts, mountain lion, and deer hunting trips. We also offer horseback riding. Always wanted to hunt a bull elk and experience the spectacular untamed Montana backcountry? Enjoy the thrill of tramping through prime elk hunting country taking in the sights and smells of mother nature. Experienced professionals Cody and LeRee Hensen will be your guides and hosts for the duration of your elk hunting trip. After a long day of elk and deer hunting, return to camp where comfortable, warm wall tents and stoves are set up for you. In a separate cook tent, you'll be served delicious hearty homemade meals for breakfast and dinner. We take pack lunches during the day. The Hensens will tell you, "We believe in doing everything possible to ensure you will have a successful and memorable elk, deer hunt or mountain lion hunt." Owners and operators of Royal Tine Outfitters since 1994, Cody and LeRee Hensen have vast and varied experience in Montana hunting trips as well as other regions such as Alaska, Idaho, Wyoming and Arizona. Now they've returned to specialize in their home state of Montana where they are outfitters and guides for archery and rifle elk hunts for elk, deer, and mountain lion. Licensed by the Montana Board of Outfitters (#6035) and permitted by the Beaverhead-Deer Lodge National Forest. Call us for information and references on your guided Montana elk hunting trip of a lifetime!! Contact us for updates and last minute availability on our guided elk hunts. Be sure to check out the backcountry hunts page to see a video clip of two bull elk coming into the meadow by our private elk hunting camp! Also, take a video virtual tour of our hunting camp on the photo gallery page. Want to ride horses? Check out we we offer on our Montana horseback trail rides page!